Craig and I seem to be addicted to the TV show Undercover Boss. We always say we are not going to watch it, but I see the previews while I watch The Amazing Race and can’t help but leave Undercover Boss on. 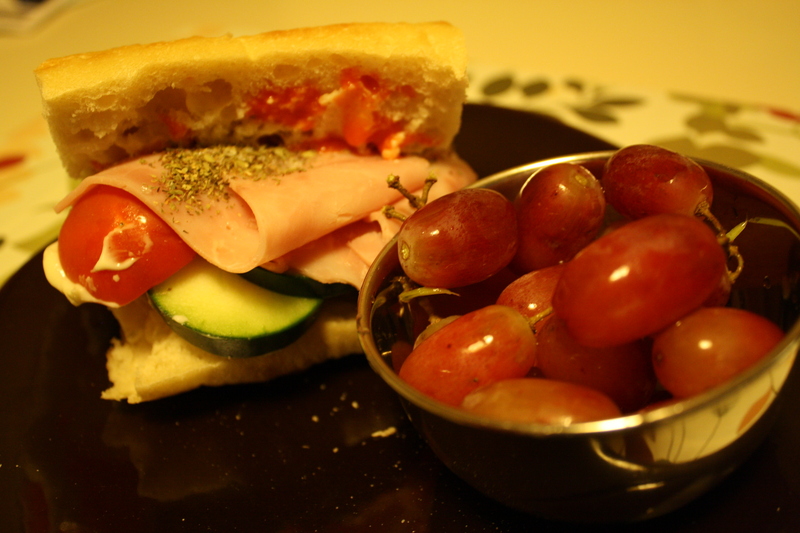 This past Sunday, they featured Subway and both Craig and I found ourselves craving a Subway sandwich. We fulfilled that craving tonight by having it for dinner. We had a buy one footlong, get one free coupon and then we always have another half for lunch the next day. 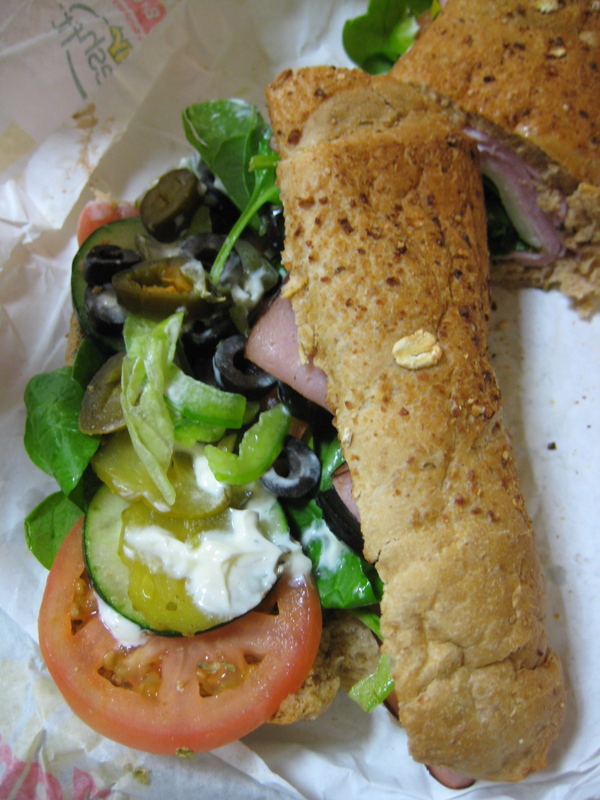 I got the “usual”–nine grain honey oat with ham and provolone, spinach, black olives, green peppers, tomatoes, pickles and a little bit of jalapenos. After Subway, we went to the library. We are geeks, I know this and it’s ok. Craig and I love libraries. I read Self magazine while Craig picked out a huge stack of DVDs to watch over the four day weekend. 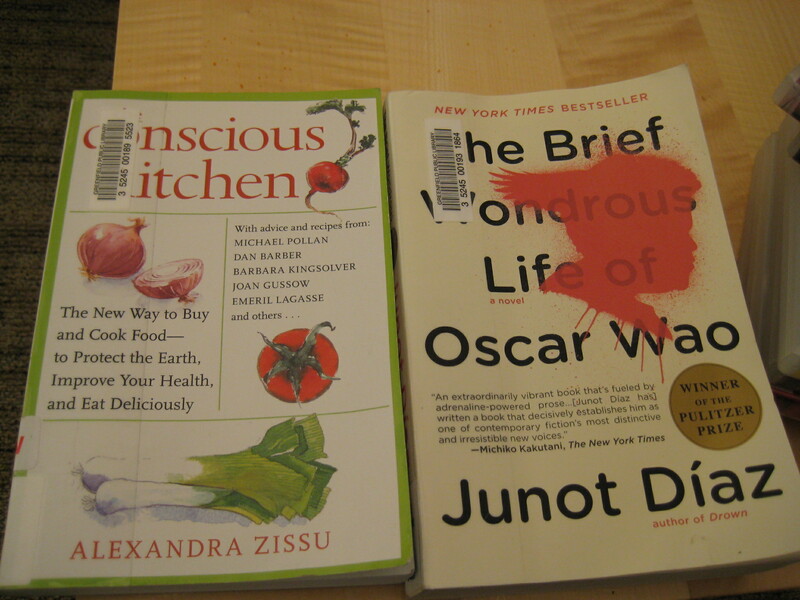 I picked out two books–Conscious Kitchen by Alexandra Zissu and The Brief Wondrous Life of Oscar Wao by Junot Diaz. I hope I don’t slack off over the weekend and find some time to read these. 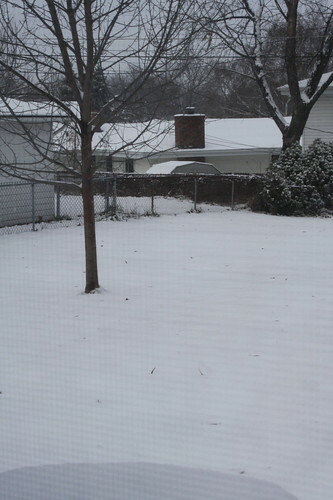 I have high hopes for that and for cooking & baking. 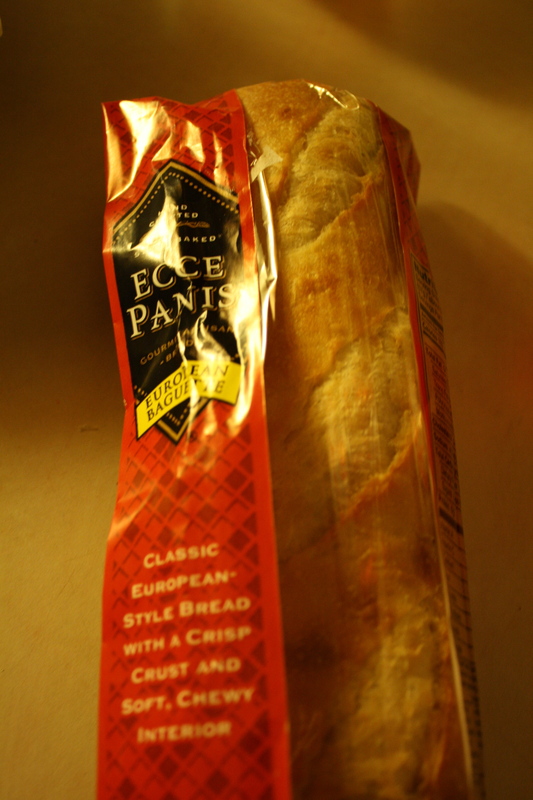 Rewind to my other meals of the day. 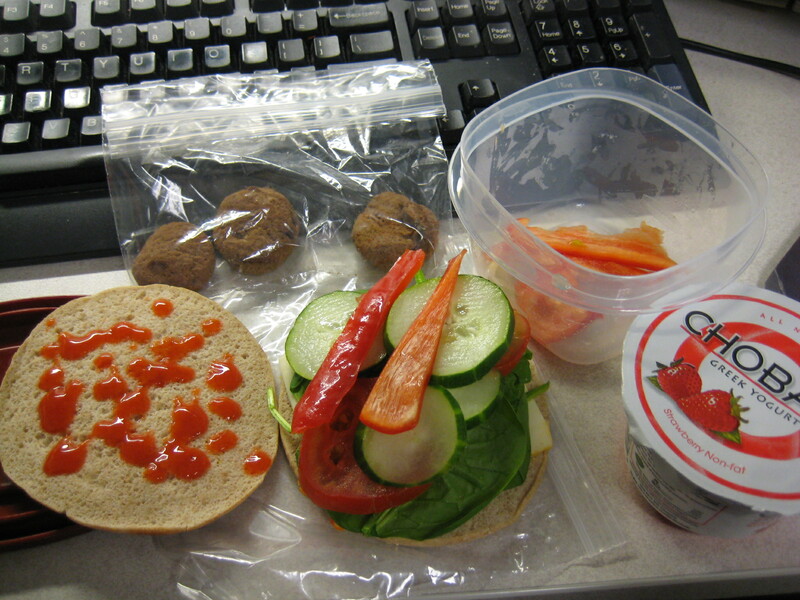 Lunch was an Arnold’s Thin with Muenster cheese, spinach, cucumbers, red peppers, & Frank’s Red hot sauce; a Strawberry Chobani and three Chocolate Chocolate Chip Newman’s Own Organic cookies for dessert. 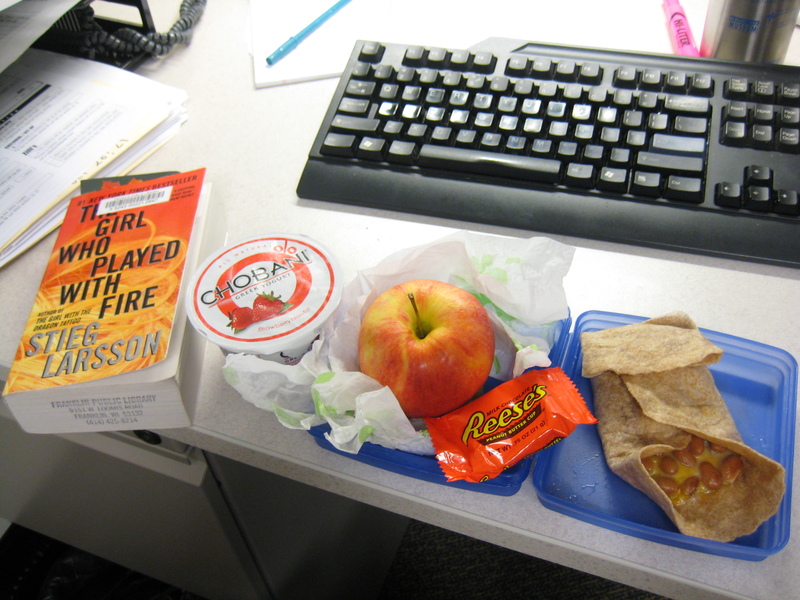 I know it’s not the healthiest, but I eat lunch at my desk every day during the winter. I like to read blogs, check my e-mail and read books. I am not much of a social person when it comes to lunch. To relax, I prefer my routine. In the summer, I take walks and eat outside. 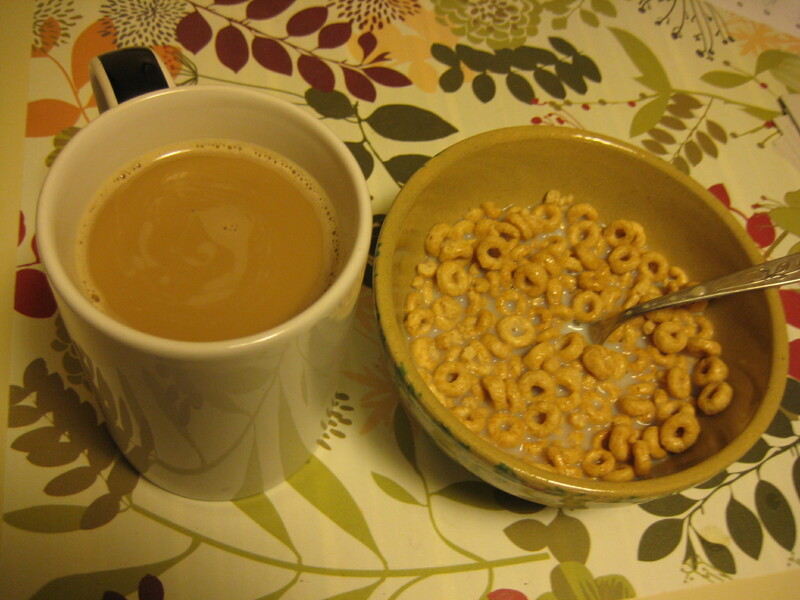 Breakfast was Honey Nut Cheerios with skim milk and coffee with Pumpkin Spice creamer. Tuesday is usually my rest day from the gym, but I went because the YMCA will be closed on Thanksgiving. I also went because I was not sore at all from Boot Camp yesterday. I just biked for 15 minutes to get my legs moving and did 8 of the weight machine circuit stations. It was super busy, so I had trouble getting on all of the machines. That’s ok though, I mostly wanted to cover my legs to strength train for my ankle injuries and I accomplished that goal. 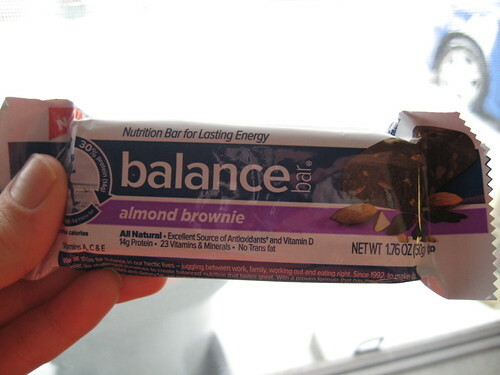 Off to work on my “Why I love the Y” post! I started writing it at lunch today and hope I can finish it tonight.